Illustrated by John Buscema in the early stages, as I remember, who was replaced by Herb Trimpe, and then when people complained (someone on the letters page suggested that Trimpe drew with his feet), Pablo Marcos. We dared not complain about Pablo Marcos, as we didn't want to find out what could possibly be worse than that. 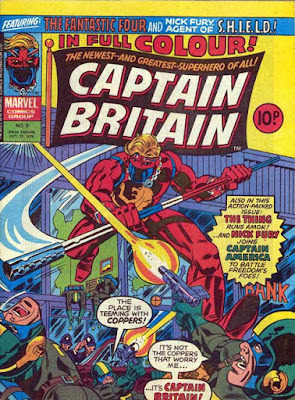 Written by Chris Claremont initially (who got the gig because he'd been on holiday to England once, although he seems to have been on drugs at the time), and then someone else. Can't remember who. Dez Skinn, probably. 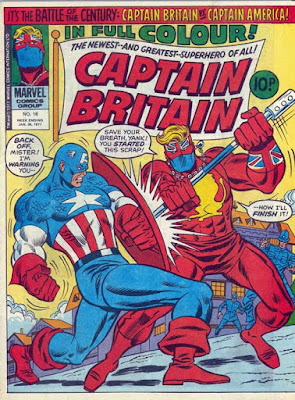 Eventually reclaimed by Alan Moore in his pre-Swamp Thing days. I wrote that off the top of my head - how much did I get right? Zounds! Perhaps he'll take a spanner from the boot of his lorrie, pop across the Channel and give old Jerry a drubbing! Bugger all! CLUE: THE CORRECT ANSWER IS "F"